The technological tools for archiving the web have been evolving steadily for more than a decade. However, best practices and a common model of web archiving have yet to emerge. developed this model based on its work with memory institutions around the world. result, funding remains limited or non-existent. through email, phone calls, and in-person conversations at conferences and partner meetings. Additionally, more formal feedback comes through partner presentations at conferences, surveys designed by Archive-It staff, as well as formal or informal literature partners create relating how they and their colleagues meet the challenges of web archiving. paper also comes from a survey of Archive-It partners conducted in August 2012.
significant amount of overlap between them. includes circles within circles to suggest these repetitive cycles within the bigger process. ongoing process that occurs in tandem with a number of other activities in the life cycle. 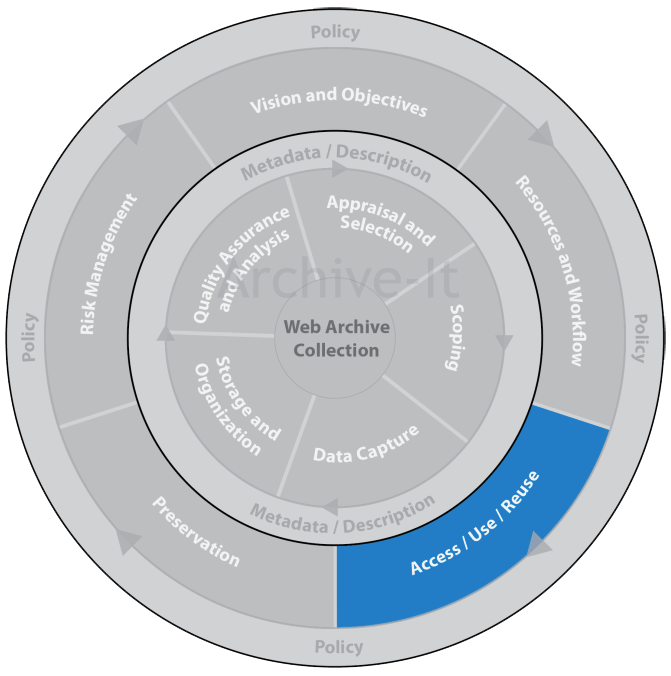 The blue circle just inside the policy band represents the high-level decisions an institution faces as it sets up and manages its web archiving program. The individual steps are briefly defined as follows and will be discussed in more depth later in this paper. 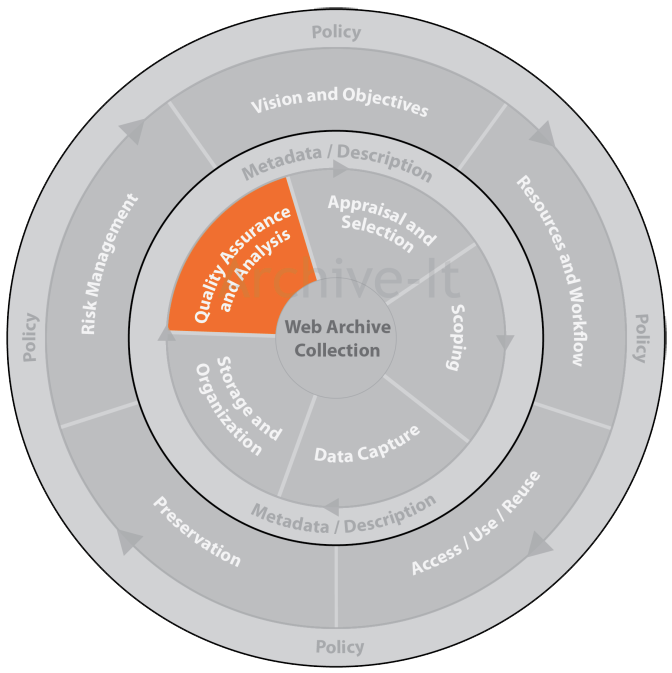 Vision and Objectives: institutions clarify the goals of their web archiving program. Resources and Workflow: institutions review their available resources including finances, expertise, staff, potential collaborators and others in order to determine how to proceed with developing or changing their web archiving program. Access / Use / Reuse: institutions make decisions about whether and how to provide access to their collections and monitor how patrons use the content. Preservation: institutions make decisions about how they want to preserve the data they collect in their web archiving activities. This includes both data files and metadata. Risk Management: institutions consider their approach to risk in creating a web archiving program, they look at copyright and permissions as well as access. Appraisal and Selection: institutions decide specifically which websites they want to collect. Scoping: institutions may opt to archive portions of a website, whole sites, or even entire web domains. Data Capture: institutions fine-tune how they want to capture their data through decisions about crawl (capture) frequency and types of files to archive or not archive. The scoping and data capture phases of the life cycle often overlap as they involve similar activities and decisions. Storage and Organization: This step includes a temporary or long-term storage plan for the archived data. For some institutions, the storage and organization phase of the life cycle might also constitute their preservation activities. Quality Assurance and Analysis: institutions review what they have archived and how well the resulting collection satisfies the goals they set at the beginning of the life cycle. At the center of the life cycle is the collection itself, the archived web content. This data is the end result of all preceding steps, and it is what will be preserved. Capturing and preserving collections of data is at the heart of all web archiving activities and is therefore the center of the model. 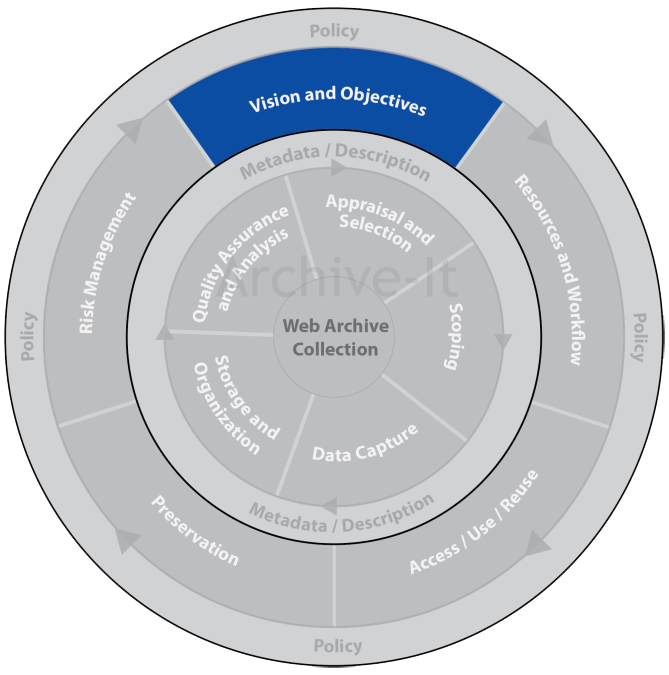 To determine a vision and objective for web archiving (see Figure 2), an institution must ask itself why it is choosing to archive the web, what it wants to accomplish in doing so, and how these steps relate to the institution’s broader mission. 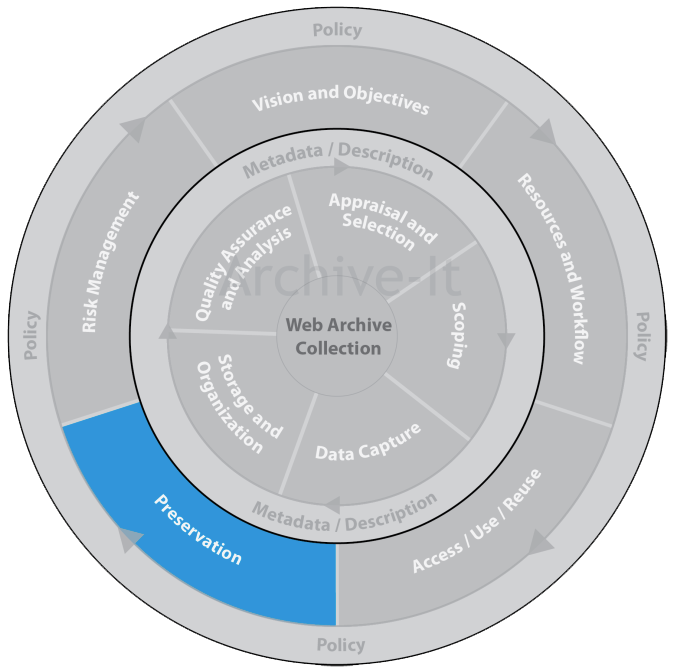 This step in the cycle primarily occurs as institutions initially plan their program; however, institutions do tend to revisit and redefine their web archiving objectives throughout the life of the program. These periods of reexamination may result from a specific stimulus, such as a change of resources, or may be an ongoing question considered along with and in relation to their other collection policies. record of their institution’s web presence over time. Still other institutions view web archiving as an extension of their overarching collection development policy or their digital preservation programs, and they may archive web content that enhances or supplements the topics already emphasized in their traditional collecting activities. Researchers and academics are also recognizing the increasing influence of social media sites, and the importance of creating a thematic/topical web archive on a specific subject or topic that includes different perspectives and social commentary only available in tweets, blogs, posts and comments. Additionally, state and local archives need to capture the social media profiles and activities of their elected officials and agencies. Many institutions have diverse goals and as a result set up multiple collections to achieve each objective. 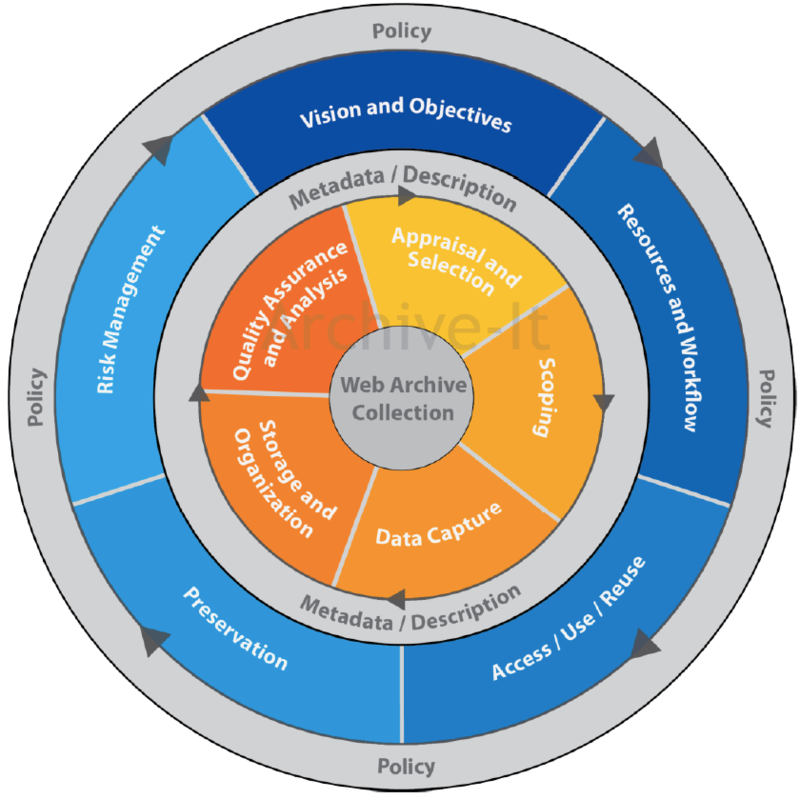 Regardless of the specific vision for each web archiving program, the vision shapes many of the policies and decisions made in later steps of the web archiving life cycle. As one example, Columbia University Library has been working with Archive-It since 2008. The library collects web content in several areas. First, the library captures the Columbia University web domain in coordination with University Archives. Second, the library has several other collections built around specific themes and topics: global human rights, historic preservation and city planning, and New York City religious institutions. These born-digital collections complement and supplement the library’s existing physical collecting activities. Columbia describes its overarching goal in web archiving as “believ[ing] that freely available web content [is] an increasingly important source of content necessary for current and future research that [is] not yet integrated into academic library collection development models” (Thurman and Fallon 2012). Similar to Columbia University, University of Alberta also realized that the university was not capturing born digital material and that it needed to include web archiving in its vision for its digital preservation strategy. However, the university did not start out with such a clear vision. Originally, the University of Alberta inherited over eighty websites from a non-profit organization that lost its funding. Realizing that hosting these websites would be resource intensive, the university took an “archiving” approach, which they felt would be a more sustainable way to take custody of the content. University of Alberta thus began using the Archive-It application to complete this project. Their first year with Archive-It (2009) was largely focused on the websites inherited from the dissolved non-profit organization (Harder 2012). digital scholarship, they want to make sure researchers are able to use their web archive collections just as they now use other resources (Harder 2012). and services, work to strengthen Montana public libraries, and provide visually or physically handicapped Montanans access to library resources” (Downs, Kammerer and Stockwell 2012). program, including selection criteria for what to archive, crawl frequency, and outreach. successful and is meeting the objectives of the state library. day-to-day activities of web archiving. For example, how much time can an institution spend reviewing their crawls or how many people should add websites to the Archive-It application? Subsequent sections of this paper will discuss specific management workflows in depth. One of the key resources organizations have at their disposal is their staff. In-depth discussions with several Archive-It partners in the spring and summer of 2012, as well as a survey of fellow Archive-It partners, conducted by Marquette University, reveal some comprehensive data regarding the staffing models in place at a wide range of Archive-It partner institutions. Of the thirty-seven institutions that responded to the Marquette University survey, one-third have two or more individuals involved with Archive-It, and over 25% have four or more individuals involved. The survey also found that half of the responding institutions spend less than one hour per week working with their Archive-It accounts, and 44% spend 1-5 hours per week working with the application. The Marquette survey also asked respondents to describe the types of individuals working within Archive-It. Table 1 displays these findings; please note that respondents could select more than one staff grouping, so results do not sum to 100% (Sweetser 2011). Discussions with the six Archive-It partners highlighted in this paper revealed similar results to the Marquette survey. The partners provided details about their Archive-It staffing, including the number of staff and nature of their work. The results are summarized in Table 2. These results share another similarity with the Marquette University survey results: most of the staff tend to come from the library or archives (the Archive-It team is inferring that subject specialists and metadata curators are part of a library staff), with additional involvement from information technology staff and students. In addition to staffing, the resources and workflow in this model also encompass how institutions manage other resources. For example, Columbia University uses an internal database to track any information that cannot be included in the Archive-It application, such as administrative information and permissions data from sites they have contacted. 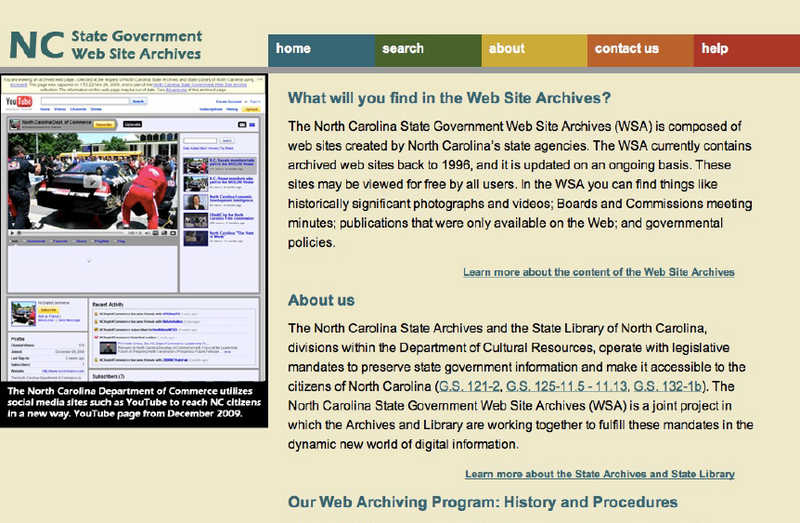 Another example is the decision to collaborate and divide management of the web archiving program between the State Library of North Carolina and the North Carolina State Archives. The two institutions manage a single collection of state government agency websites. In dividing up the day-to-day work, the two agencies have several well-established workflows, which they have developed since they first began using Archive-It in 2005. The state library and archives alternate responsibility for conducting the crawls, and both institutions perform quality control of the data harvested. The individual staff members have turned over throughout the years; however, despite this turnover, the institutions have found that their partnership has been an “easy collaboration to maintain” (Eubank, et al. 2012). Currently (2012) one web curator runs crawls, scopes seeds and manages the Archive-It account, although they have had two web curators in the past. Students, the metadata curators, and web programmers also use different parts of the application on a more limited basis. Creighton University has one full-time archivist, and one of his responsibilities is to administer Archive-It; he also gets a small amount of help from others at the Library. University of Alberta has a very large network of individuals actively using Archive-It, many of whom are subject specialists. The most active users are the state publications librarian (who oversees the program), the metadata cataloger, and the library systems programmer/analyst who handles technical issues. Management of Archive-It is evenly split with two representatives from the state library and the state archives. Of the six Archive-It institutions highlighted in this paper, the University of Alberta has the largest web archiving program in terms of staffing. The University of Alberta began using Archive-It with a small team of several individuals in 2009, and the team has since grown to over twenty-two people actively contributing to the program. They have also incorporated a number of subject specialists into their work. Additionally, the team has a government documents librarian and a metadata librarian involved in the application. A representative from information technology supports these individuals and filters their questions to Archive-It staff at Internet Archive. At a higher level, the library has a “born digital working group” composed of staff from around the library. This group, composed mostly of individuals from collection development, helps shape web archiving policy in general and use of Archive-It in particular. Additionally, an Archive-It users group, which has a broad membership base, builds and shares knowledge about Archive-It. Unlike the University of Alberta, Creighton University only has one archivist who manages the university’s Archive-It subscription and also initially championed it as a necessary resource. David Crawford learned about Archive-It at the 2008 Society of American Archivists conference and worked to build support for setting up an Archive-It subscription at Creighton. Eventually, he received a donation from a board member to initiate their web archiving program by funding a subscription to Archive-It. Using a tool like Archive-It allows Crawford to accomplish his goal of archiving the university’s web presence, which he would not have been able to do on his own due to a lack of in-house expertise (Crawford 2012). Crawford’s experience of having to build support for web archiving on his own seems consistent with interactions Internet Archive has had with other small institutions like Creighton University. Smaller institutions often take longer to get their program up and running due to fewer staffing and fiscal resources. Some smaller colleges and universities have formed consortiums to support their web archiving programs in order to expand their pool of resources for web archiving (see for example the Tri-College Consortium of Bryn Mawr, Swarthmore and Haverford: http://www.archive-it.org/organizations/74, one of the original Archive-It pilot partners). 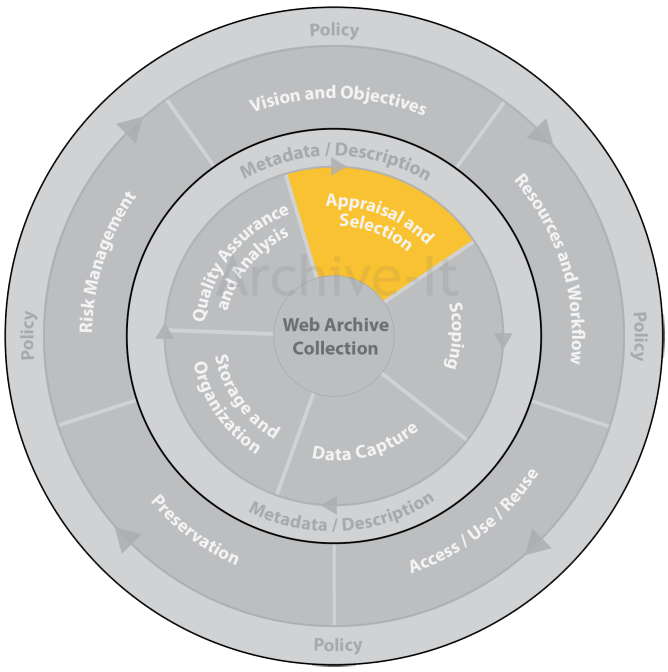 Establishing access, use, and reuse policies is vital to a successful web archiving program (see Figure 4). Institutions consider whether and how they want to provide open access to their web archives, if and how to promote the collections, as well as how to govern public use of the material. Managing these processes is the primary goal of the access/use/reuse phase of the web archiving life cycle. Part of the creation of an access policy will include choosing the specific technology or tool to provide access to the archived webpages. 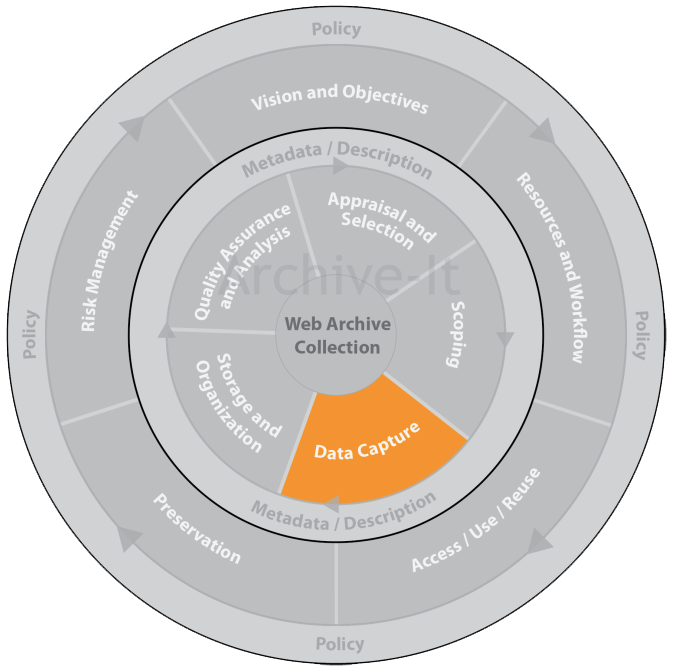 However, for the purposes of this model, the Archive-It team instead considers the higher-level policy decisions around access. This is in part due to the fact that all of the individuals interviewed for this project access web archives using Wayback software, the open-source viewing tool that allows the public to browse archived webpages just as they would experience a live webpage. The majority of Archive-It partners have their archived content publicly available, although an increasing number are requiring some content to be kept restricted for a period of time—either a specific URL or domain, an individual collection, or their entire account with multiple collections. And the Archive-It team is starting to see more requests for content to be restricted by IP address to enable reading rooms in university libraries to have more flexibility around access. (Note: the service expects to have this capability in April 2013). Archive-It partners can refer their patrons to the Archive-It website (http://www.archiveit.org) for collection access or they can link to their collections from their own site through a search box or links to the Wayback software. Both approaches work for partners depending on their access needs. A fair number of Archive-It partners create separate landing pages for their collections with their organization’s look and feel. For example, the State Library of North Carolina and the North Carolina State Archives provide access to their Archive-It collections from their own website. They have created a robust portal, which provides information about web archives for the public and information professionals, as well as instructions for using the web archives (http://webarchives.ncdcr.gov/) (see Figures 5 and 6). Additional examples of Archive-It partner landing pages can be found online at https://webarchive.jira.com/wiki/display/ARIH/Partners%27+Web+Pages+for+Archive-It+Collections. Creighton University, on the other hand, has taken a different approach. They refer their patrons to the Archive-It website for access to the collections and do not provide access from their institutional website. In David Crawford’s words, they prefer their patrons to be “self directed” (Crawford 2012). 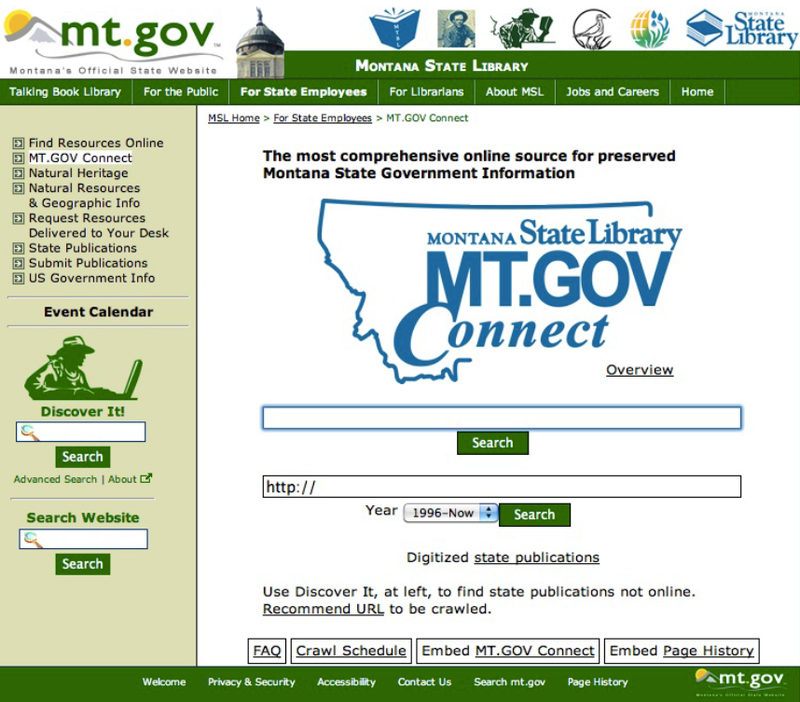 Like the State Library of North Carolina and the North Carolina State Archives, Montana’s State Library also created a portal on their own website that provides access to their Archive-It collections (http://msl.mt.gov/For_State_Employees/connect/default.asp).1 In addition to providing access to data collected using the Archive-It service, Montana State Library extracted older webpages dating back to 1996 from the Internet Archive’s general web archive. These webpages are accessible from the portal along with their Archive-It data, which dates back to 2006. The library’s goal for providing access through their own website is to “create a single identifiable brand that will be associated with state government information” (Downs, Kammerer and Stockwell 2012). Montana State Library has also found other innovative ways to draw attention to their web archives. All Montana State Library webpages contain a “page history” link in the footer. These links direct visitors to archived versions of the webpage so they can see how it has changed over time. For example, the “page history” on the state library’s home webpage http://msl.mt.gov/2 directs the visitor to a list of easy to browse capture dates for that webpage: http://wayback.archive-it.org/499/query?type=urlquery&url=http://msl.mt.gov/&dates= (see Figures 7 and 8). Archive servers. A few partner institutions are working to incorporate WARC files into their local digital repository, although these projects are still in their infancy. The Internet Archive follows best practices for preservation with redundancy, transparency and data integrity checks. And the Archive-It service works with several preservation systems to facilitate other criteria to meet our partners’ needs. Based on a recent survey completed by Archive-It partners, partners do want to preserve their data and have multiple copies of their data in multiple locations. However, they are grappling with how to get there. In the survey, 56% of respondents answered that they would like to store their data in their own local repository (regardless of the platform they use). However, 31% of partners reported that they prefer to store their data at the Internet Archive, either because they are satisfied with that strategy or do not have the means to preserve the data elsewhere. Approximately 60% of respondents do not yet have a local digital repository. The two highest cited reasons for not having a repository are “unsure of our needs” and “weighing which system to choose” (Hanna 2012). These results along with anecdotal information gathered over the years from Archive-It partners strongly suggest that partners are grappling with issues of how to preserve the data they collect from web archiving, and one can expect substantial developments in this area of the model in the coming years. In developing a web archiving program, many institutions consider the level of risk related to copyright they are willing to accept and how they will manage this risk (see Figure 10). Whether and how institutions decide to seek permission from site owners before archiving is one of the clearest examples of risk management policy making in action. The Archive-It service has long used robots.txt (a web standard) as a permissions management tool, which provides an automatic way for site owners to exclude their sites from the archiving process. In addition to the robots.txt protocol, Archive-It partners sometimes seek out website owners to get written permission before beginning to harvest. For example, Columbia University contacts site owners directly and formally asks permission to archive websites before they begin their harvests. This is a multi-week process in which the site owner is contacted twice. If there is no response to the first contact after three weeks, the Columbia University team sends a follow up message. If they still do not hear anything after an additional three weeks, they proceed with the harvest. Overall, Columbia’s response rate is 52%: of 783 sites contacted, 400 responded and granted permission, 378 did not respond, and only five site owners have responded negatively asking that their sites not be archived (Thurman and Fallon 2012). Similarly, the University of Alberta selectively asks permission for sites they archive. This decision was based on discussions with their legal department who gave them a “risk threshold” to follow, and they ask permission when necessary to stay within this threshold (Harder 2012). Risk management decisions can also be seen in the choices institutions make when deciding which sites to archive. 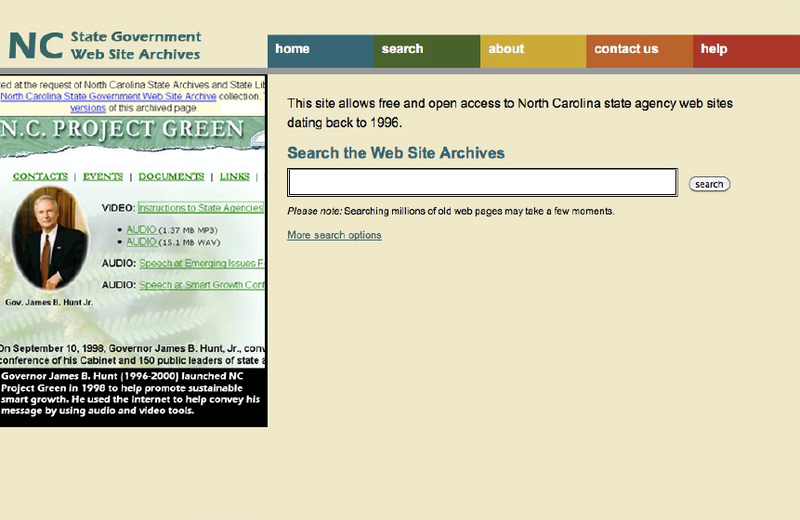 Originally, the State Library of North Carolina and the North Carolina State Archives collected only state agency websites. However, in 2009, they started collecting the feeds of state agencies on social networking sites like Facebook, Twitter and Flickr. Despite the fact that the content was on a third-party website and not controlled by a North Carolina state agency, the archivists and librarians made the decision to move forward with the archiving after weighing the potential risks and outcomes (Eubank, et al. 2012). Not all organizations ask for permission before capturing content; many organizations are clear that as an archive and/or a library, their organization has the right and the mandate to capture publicly available content on the live web. “Fair use” is a phrase the Archive-It team hears from partners when deciding to capture publicly available web content. In many cases, an organization’s mandate extends to include ignoring robots.txt on CSS and stylesheets so the archived webpage renders completely. And in some cases this policy includes researchers and historians capturing documents and/or websites (including publicly available content on social media sites) to be able to present an accurate and comprehensive portrayal of a subject matter. Risk can be managed and mitigated preemptively, and sometimes institutions may need to address potential issues that come up after archiving of content has taken place. At Creighton University, a photographer became upset that his website had been archived, despite the fact that the site was part of the publicly available university web space and was therefore crawled per University records management policy. Creighton University decided to remove the website from the archive and worked with the Archive-It team to handle the issue, and the content was removed within hours. Since then, Creighton University has decided that if there is a risk of embarrassment or litigation, they will remove content from the web archive (Crawford 2012). Note: The Archive-It service does not take a stand on copyright, and follows the Oakland Archive Policy, established in 2002, striving to work collaboratively with content providers. The service will honor requests to remove content from public access. opposed to scraping it from the site. (collection, seed, or document) within their external catalog systems. (Sweetser 2011). Overall, the Marquette survey authors conclude it is likely that Archive-It partners are not generating metadata for their collections in the Archive-It application itself. Sweetser offers three possible reasons for this: “organizations just haven’t yet gotten around to preparing metadata in Archive-It and are still in their infancy in terms of their web archiving efforts. Organizations do not believe that metadata is warranted or useful to be created [and] organizations are focusing their metadata creation practices in areas outside the Archive-It platform” (Sweetser 2011). 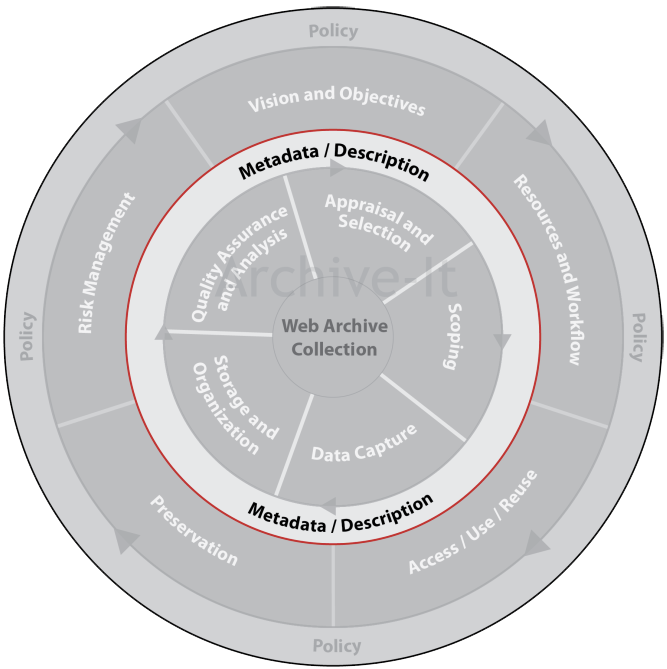 The preceding life cycle phases have been part of the outer circle of the model, which relates to the broader questions around creating and defining an institutional web archiving program. The remaining phases of the model, or those in the inner circle, describe the day-today activities of managing a web archiving program. collecting activities. In the appraisal and selection phase, however, institutions choose the specific URLs they will archive. As the forthcoming examples indicate, institutions can make these choices in a variety of ways, with different types of individuals contributing. State archives and libraries, for example, typically focus their web archiving efforts primarily on state agency websites and records, collecting those URLs. This is true of Montana State Library, the State Library of North Carolina and the North Carolina State Archives. However, in the case of North Carolina, they also archive social media feeds generated by state agencies on Facebook, Twitter and Flickr because they see these feeds as extensions of the official web based records. This policy decision is further described in the risk management section of this paper. Universities that archive the web sometimes take a different approach to site appraisal. They tend to archive the university web presence and/or create collections based on specific themes. For example, the major topic areas of Columbia University and the University of Alberta web archive collections include human rights issues and Canadian industry and culture, respectively. Translating the institution’s major objectives into a list of sites to crawl is the goal of the appraisal and selection process. For instance, to do so, the University of Alberta works with subject liaisons to choose URLs. Appraisal and selection is an evolving area and one the Archive-It team is learning more about from their partners as their needs become more nuanced and sophisticated. After choosing what sites to archive, institutions must decide if they want to archive entire websites or portions thereof (see Figure 13). This can be done before the first page is captured or after content is harvested as part of the overall collection quality review. This part of the life cycle can be quite technical depending on their scoping parameters and the formats of the web content they are capturing. Additionally some partners only want to capture a singular format, such as PDFs from their target websites. Currently 27% of Archive-It partners run some crawls that capture only PDFs, and the team expects to see this percentage increase as PDFs become more prevalent on the web and increasingly the only copy of a record available (Hanna 2012). The Archive-It service is researching adding this capability for other types of file formats. As mentioned above, the scoping process can be quite technical and partners sometimes find themselves at the whim of sites or file formats that are not archive friendly. Regular expressions, SURTs, imposing data and/or time limits and other scoping rules can help partners navigate the complex world of archiving web content. The complexities involved in effective crawl scoping were a surprise to the team at the University of Alberta. They have found that they need to re-adjust their policies as they crawl, sometimes adapting to the kind of data they actually can collect, given that some content can be difficult to capture (Harder 2012). Similarly, Creighton University has also found that scoping a crawl involves some extra work; David Crawford finds that he often needs to educate people on campus about the web space, and he tries to work with web programmers to request that they consider crawling needs when making changes to sites in the future (Crawford 2012). Once institutions have chosen which websites, and how much of those sites they would like to capture, they put their plans into action in the data capture phase of the process (see Figure 14). Here, they will deal with the nuts and bolts of the crawling software. They will determine the frequency and timing of their crawls and when to cut-off long crawls, and then they will set their crawls to begin. The Archive-It application includes features that allow partners to make adjustments to the frequency and duration settings in the open source web crawler (Heritrix). Scheduling crawls for ongoing and reiterative data capture is an area where institutions using Archive-It exercise a lot of control over their crawls. Archive-It allows for nine reoccurring crawl frequencies ranging from twice-daily to annual, as well as a one time crawl that does not repeat. Data gathered in 2013 showed that 71% of all Archive-It partners use more than one crawl frequency. In other words, they do not crawl all of their sites at one interval; they use different schedules for different collections and websites, based on how often they wish to capture particular sites. At the time the data was collected, the most popular crawl frequencies were one time, weekly, and monthly. Given how diverse websites are in terms of their structure and construction, the data capture step of web archiving can produce a number of surprises. For example, a site can be much bigger than anticipated and therefore exhaust storage resources. Similarly, there are ways for web masters to keep their sites from being archived, which can require technological intervention or negotiation between the parties involved. For example, David Crawford from Creighton University experienced issues archiving websites, issues he knew that webmasters could prevent. When he began discussing the issues with the webmasters, he was surprised by how little they new about the inner workings of their websites (Crawford 2012). To try and prevent data capture surprises, Archive-It encourages partners to use a test crawl feature that produces a full suite of reports on data crawled without actually capturing that data. This option allows institutions to see what they would have archived without using their resources unnecessarily. The recent Archive-It partner survey shows that 69% of respondents always or often run test crawls when adding new seeds or starting a new collection (Hanna 2012). After institutions capture data from their desired sites, they review what they archived and assess its quality and completeness (see Figure 15). This can be done through reports generated by crawlers or by clicking through the archived websites themselves by way of an access tool like the Wayback software. The process of web archiving can include trial and error. Like most aspects of web archiving, no single best practice for Quality Assurance (QA) has emerged among institutions that archive the web. However, there are some common trends among Archive-It partners in terms of the types of crawl information they review. While the amount of time and attention each institution spends doing QA varies based on their staffing levels and their goals in web archiving, anecdotally, partners report spending more time on QA and reviewing reports when they initially set up a new collection, or when they add new seeds to an existing collection. Once reoccurring crawls have been running, QA is more of a sporadic or maintenance activity, and consumes less time and attention. Archive-It survey data shows that a majority of partners often or always review their post-crawl reports generated as part of the service. Institutions tend to be interested in how much material and exactly what kind of material they are collecting when they start a web archiving program. Findings from the 2012 summer survey of Archive-It partners show that 68% of responding institutions review their host reports on a regular basis; only 11% rarely or never do so. Reviewing reports can take time, and reviewers need to know what kind of anomalies to look for. Three survey respondents said that the lack of staff/resources makes it difficult to analyze reports after every crawl (Hanna 2012). In 2011, the service implemented an automated QA tool and the ability to run a patch crawl on top-level URLs that had not captured completely the first time around. The response has been positive and the service has been working on extending the QA tool capabilities. Some partners have developed their own QA tools to work specifically with their content and meeting their institutional guidelines. For example, to assist with their QA workflow, State Library of North Carolina has developed an external constraint analysis tool that they use to conduct a visual review of embedded documents and determine whether they should be in scope for future crawls. This tool is open source, and available at https://github.com/SLNCDIMP/Constraint-Analysis. 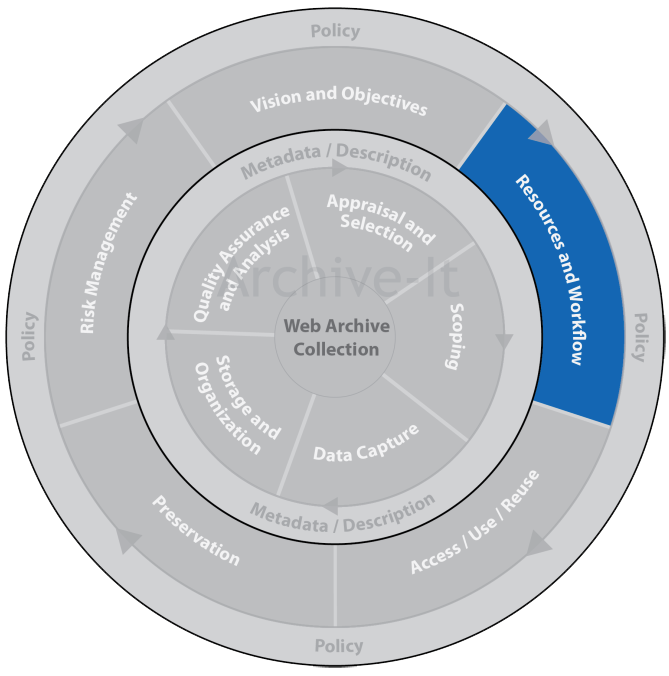 The Web Archiving Life Cycle Model is one step on the road to creating a set of best practices for establishing and maintaining a web archiving program. After more than seven years of running the Archive-It service and working with forward thinking partners, it is clear to the Archive-It team that the web does remain “a mess” and that it is in the best interest of the entire web archiving community to continue to work together to find solutions for capturing and displaying web content. As technology continues to develop and as information is increasingly published exclusively online, more institutions of all sizes will need to be archiving web content. Many of the Archive-It partners have been pioneers in web archiving and enjoy sharing what they have learned. 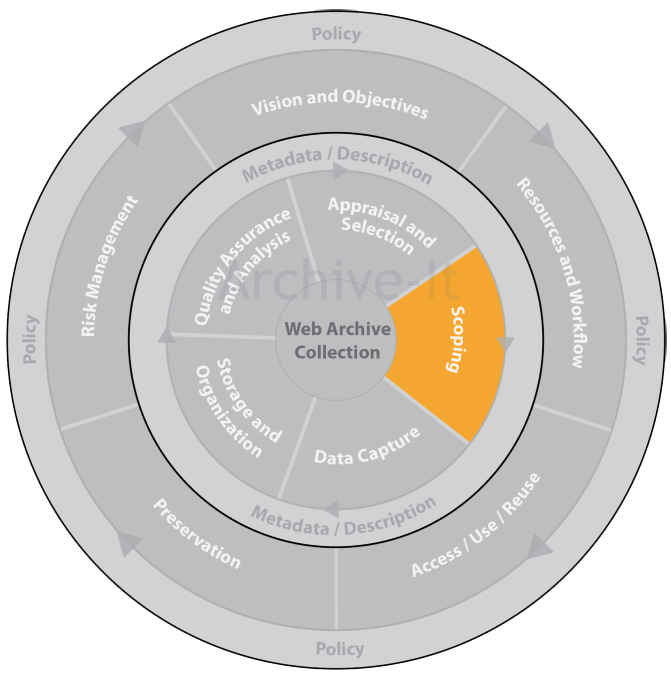 And even as the Archive-It team shares its knowledge in this paper, the team knows that the web and best practices for web archiving will continue to evolve. The model is an attempt to incorporate the technological and programmatic arms of web archiving into a framework that will be relevant to any organization seeking to archive the web, regardless of organization size, budget or technical methods of web archiving. 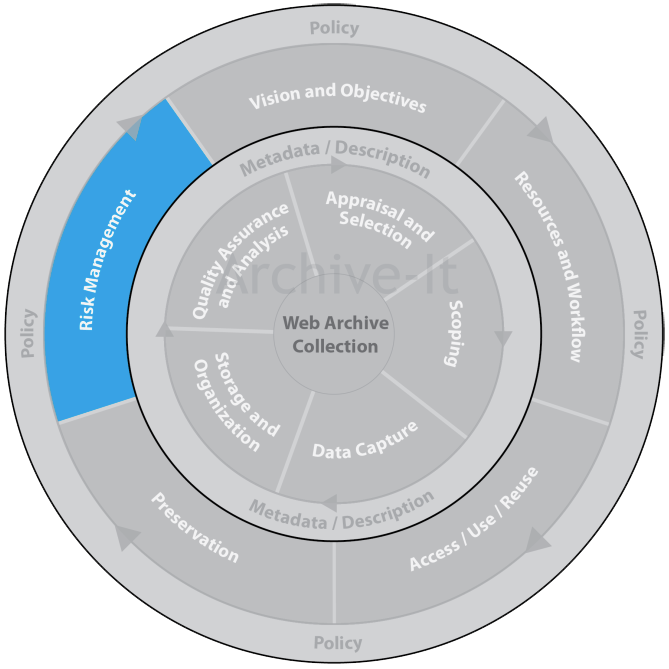 The Archive-It team anticipates that the Web Archiving Life Cycle Model and the institutions that work with it are flexible enough to grow and evolve side by side with the web they are trying to archive. Crawford, D., personal communication, July 2012. Downs, B., Kammerer, J., & Stockwell, C, personal communication, May 2012. Eubank, K., Gregory L., Kenney, K., & Trent, R., personal communication, June 2012. Hanna, K., personal communication, September 2012. Harder, G., personal communication, June 2012. Thurman, A., & Fallon, T., personal communication, May 2012 and February 2013.